A map drawn by First World War desert commander TE Lawrence will go on sale at Sotheby’s in London on 4 November 2014. The hand-drawn map shows an area of Saudi Arabia that Lawrence and his men crossed in May 1917 as they approached the Red Sea port of Aqaba. The map was recently shown in major exhibitions at the Imperial War Museum in London and at the Australian War Memorial Canberra. It is estimated to reach £70,000-100,000 at Sotheby’s London auction of Travel, Atlases, Maps and Natural History. 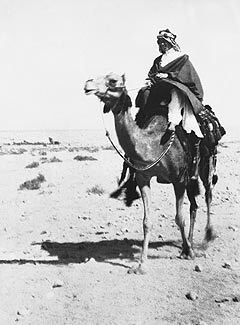 On 9 May 1917, Lawrence and the Arab armies set out from the Red Sea port of al Wejh to capture Aqaba. They reached the Hejaz railway on 19 May and continued across the desert towards Wadi Sirhan – the route that’s recorded in this map. The journey was particularly gruelling and Lawrence recorded it in his notebooks, now in the collection of the British Library, and later in his book Seven Pillars of Wisdom. Lawrence was well aware that his travels towards Aqaba had cartographical significance. Having met the explorer and cartographer Douglas Carruthers in the latter stages of the war, Lawrence created this map for him sometime between 1918 and 1922. In 1962, Carruthers donated the map to the Royal Society of Asian Affairs, in whose collection it has remained until now. This entry was posted in News, Soldiers of the Great War and tagged 1917, Aqaba, Arab Revolt, First World War Centenary, Lawrence of Arabia, map, sale, Sotheby's, World War I, WW1. Bookmark the permalink.